Product manufacturers, electronics retailers, and senior service providers continue to miss the mark when it comes to tapping an audience with spending power and an increasing interest in crossing the Great Digital Divide. But that’s slowly changing, thanks to a new generation subtly driving the industry for themselves, their families and professional caregivers, according to Varsity’s new research white paper. 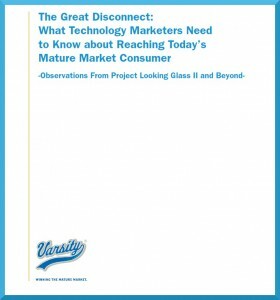 The Great Disconnect: What Technology Marketers Need to Know About Reaching Today’s Mature Market Consumer, is based on focus group findings of adults age 65-95, shop-alongs at major retailers, and observations gleaned while staying in a retirement community for one month during Project Looking Glass II. Today’s “Transitionals” — a demographic mix of Depression-era Silent Generation and early Boomers — are the driving force when it comes to product usage and expectations that were formerly the realm of younger consumers. More advances have to be widely implemented in the senior living industry and in light of the coming generations’ familiarity with technology. Children and grandchildren remain top influencers, both in terms of product education, recommendations, purchases and even repairs. Companies that facilitate aging in place will play an increasingly important role. Internet browsing is now a leisure activity, and many are influenced by mobile content. You can receive a free copy of the report here. Members of the Varsity team are available to provide in-depth presentations of the report, either via webinar or in person. To schedule a presentation or for additional information, contact Matt Bekelja at 717-652-1277 or mbekelja@varsitybranding.com.